Functional assessment can be overwhelming to educators who are not familiar with the process. This book is designed specifically for persons who have limited training in applied behavior analysis and functional assessment procedures. This easy-to-use manual will help educators understand the purpose and meaning of the functional behavior assessment process and how to identify and assess behavior. It shows how to develop and write effective Behavior Intervention Plans using data collected during the functional assessment. 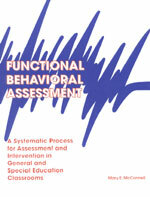 Includes dozens of checklists and plan sheets for working with Behavior Intervention Plans.